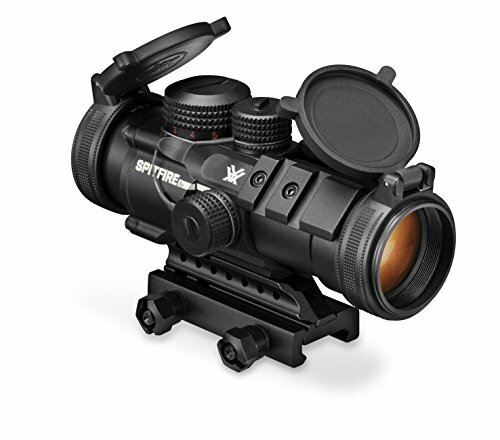 SPITFIRE 3X PRISM SCOPE: The perfect choice for the AR platform, the Vortex Spitfire 3x prism scope combines a compact, prism-based design with the intuitive glass etched EBR-556B reticle, providing vital speed, accuracy and versatility in close to medium range shooting scenarios. Prism Scopes are not compatible with the VMX-3T Magnifier. The EBR-556B reticle (Enhanced Battle Reticle) is designed around the 5.56 x 45 cartridge to aid in rapid shooting at both near and far ranges, providing holdover and ranging references from 0-500 yards. Etched directly on the prism to assure consistent point-of-aim at all times with selectable red/green illumination of five intensity levels to match specific conditions. The Spitfire 3x Prism Scope excels in close to medium range shooting applications where fast target acquisition and speed is of the essence. The prism based design allows for a compact optical system without sacrificing optical quality. Fully multi-coated lenses with anti-reflective coatings offer bright views even in low light conditions. A selectable red/green illuminated reticle features five intensity levels to match the situational conditions. The reticle is etched directly on the prism ensuring shooters have an effective point of aim at all times regardless of illumination. A fast focus eyepiece adjusts the reticle into sharp focus. A multi-height mount system allows for 30mm and 40mm mounting heights. Dual picatinny rails mounted on the Spitfire allow the optic to be paired with an offset auxillary reflex sight. With shockproof construction, the Spitfire withstands recoil and impact while nitrogen purging and o-ring seals ensure fogproof and waterproof performance.